Halloween’s just around the corner. We know how fun this time of year can be for all the kids (and kids at heart) who can’t wait to show off a clever, well-crafted costume. But everything’s more fun if you can make money doing it, right? Keep an eye out for costume contests in your community and at the events you’re attending this year. Just the right combination of hot glue, felt and glitter could earn you a bundle of cash — and a year’s worth of bragging rights. Even better, you can find tons of online costume contests that pay cash prizes, too. Below, we’ve included a list of seven free contests you can enter online — you don’t even have to leave the house! First, some tips for nailing that costume. Mary To-Saturnio and her family earned second place and a $50 prize for “Best Family Costume” in last year’s online contest with Costume Works. 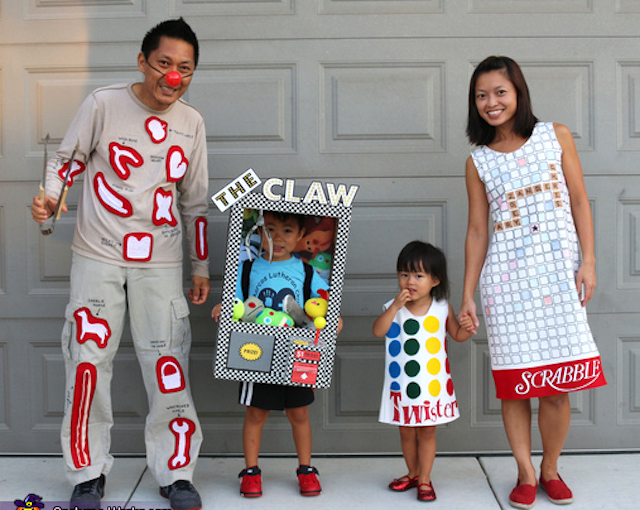 To-Saturnio hand-crafted these game-themed costumes for herself, her husband and their (now) 6-year-old son and 3-year-old daughter. The best part? She only had to buy $3.23 worth of materials to create these adorable characters. To-Saturnio is an avid “maker and crafter” and self-proclaimed “fabric hoarder,” so she had some of the basic materials and skills to get started. But, she says anyone can make simple costumes that look great. Felt and hot glue are her secret weapons for Halloween costumes. Wielding the hot glue gun is faster than sewing, and anyone can do it. Plus, To-Saturnio points out, your Halloween costume won’t face too much wear and probably won’t need to be washed, so it doesn’t have to be as durable as everyday clothing. To keep the hobby — and her budding business — affordable, she keeps an eye out for sales and keeps a stock of scraps from past projects. The day we spoke in early October, she was headed to Jo-Ann Fabric, where she knew she could get a good deal on felt compared with pricier hobby stores. She also advised that fabric stores tend to have sales leading up to Halloween — so keep an eye out for unique materials this time of year. It also helps to get the kids involved in the process. 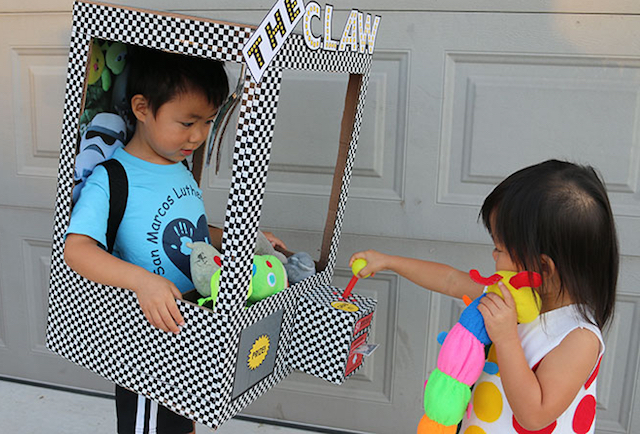 “My son likes to build stuff out of recyclables,” To-Saturnio explains, so assisting his mom with his cardboard-box-based costume can be a fun way to fill an afternoon! Even though you’ll save money, a quality costume is probably going to require a sizable time investment. To-Saturnio spends about six weeks before the holiday researching, planning and making costumes for her family. She’ll start perusing sites like Pinterest for inspiration in late September, gather materials by early October, and spend about two weeks making costumes while the kids are in school or napping. She’ll spend two to three hours on a simple costume, and as much as 10 to 15 hours on more complex costumes. But if you enjoy the process, it’s totally worth it. “I never realized how long they took because we enjoy doing it so much,” she says. Here are seven online costume contests you can enter this year. Each is free to enter — all you have to do is submit a photo online. The contest that hooked To-Saturnio and her family in 2015 is on again this year! Enter in one or more of eight categories in the Costume Works Halloween Costume Contest to win up to $300. Enter store-bought or homemade costumes in one of the following categories: pet, baby (age 0-2), children (age 3+), group, family, couple and adult. There’s also a “Most Creative Costume” category, and only homemade costumes are eligible. Read the criteria for each category to make sure your costume is a fit. You can submit multiple costumes as separate entries — unless they’re part of a couple or group costume. Submit up to 10 photos here. Also include a description of how you created the costume, which materials you used and how much it cost, if the costume is homemade. Deadline is Nov. 20. Winners will be announced and prizes paid via PayPal in late November. This popular costume retailer’s contest is in its fourth year and received 5,000 entries last year. See the winners here. This year Halloween Express will be giving away $10,500 in total cash prizes. Enter in one of the following categories: adult couples, adult singles, child/teen/tween, infant/toddler, pets and group. Your costume must be homemade! You must submit original photos of the contestant sporting the costume, taken between Sept. 1 and Nov. 4. However, you can enter a costume made at any time. You must be a U.S. resident and at least 18 years old to enter. For categories including children, only a parent or legal guardian can submit photos. Submit up to three photos of your costume online before midnight EST on Nov. 4. Include your full name, street address and email address. You’ll also need to include a brief description of the costume: your inspiration, how you made it, materials and accessories, and how it was received by others at your Halloween gatherings. Read the full rules here before submitting. Your costume will be judged on execution, originality, creativity and your written story behind the costume. Winners will be announced by Dec. 1 and paid via PayPal. The contest by Coolest Handmade Costumes is all about sharing your story and inspiring others with your creative (and cool) costume ideas. This year’s prizes aren’t specified in the guidelines, but the contest has been running since 2004 and typically awards cash prizes of $100-$150, plus two grand prizes of $300-$500. The contest has also awarded smaller prizes of store credit or gift cards for costume shops, depending on sponsors. Include a creative title for your entry, a write-up of at least 300 words about the process of creating your costume and the reactions to it, up to 10 photos and an optional video. Because your story is as important as your costume, “make sure to invest as much energy and creativity in your write up as you did in creating your costume,” the site asks. If you’re on Instagram or Facebook, you’ll probably be showing off your kids’ costumes there already. You might as well enter to win some cash from these Kid to Kid contests! Post your image to your public profile, and include the hashtags #KidtoKid and #KidtoKidCostumeContest. Deadline to enter is midnight MST on Nov. 3. On Nov. 4, Kid to Kid will select finalists and post those images to the @kidtokid Instagram profile. The finalist with the most likes to their photos posted by @kidtokid by midnight on Nov. 7 wins the $100 grand prize. Like Kid to Kid on Facebook. Post a photo of your kid(s) in costume in the comments of this post. Receive the most likes on your comment by midnight MST on Nov. 3 to win the $250 grand prize. Judges will reward their favorites from both contests with $25 gift cards at their discretion. There is one added step to entering this Halloween ComicFest contest — but it’s perfect for comic book fans and cosplayers! You’ll have to submit a photo of yourself in costume with one of 32 free Halloween ComicFest 2016 comic books, which you can pick up at your local comic book store on Oct. 29. Enter your costume in one of these categories: superhero/comics, TV/movie, gamer, horror and original. Two grand prize winners will be randomly selected to win a $500 shopping spree to their local comic shop. One adult and one child from each category will receive a $100 shopping spree to their local comic shop. One adult and one child in each category who earn the most votes online (see below) will receive a prize pack with items from contest sponsors, including Archie Comics, DK Publishing, Scholastic and more. Take a picture in costume while holding one of the free comics, and submit online here before 11:59 p.m. EST on Nov. 7. Between Nov. 1-7, fans will vote on their favorite costumes in each category on the HCF website. HCF will announce winners on Nov. 11. Your Turn: Will you enter your costume into a free online contest this year?